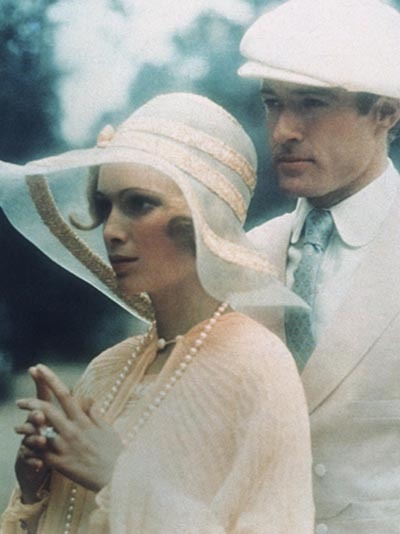 In the early 1970s, when news leaked Paramount Pictures was going to make The Great Gatsby into a movie, every A-list actor in Hollywood wanted the leading roles of Jay Gatsby and Daisy Buchanan. And, why not? F. Scott Fitzgerald’s masterwork has long been considered one of, if not the, great American novel. The author poetically captured the 1920s period of prosperity through his passionate characters and coined the phrase Jazz Age. 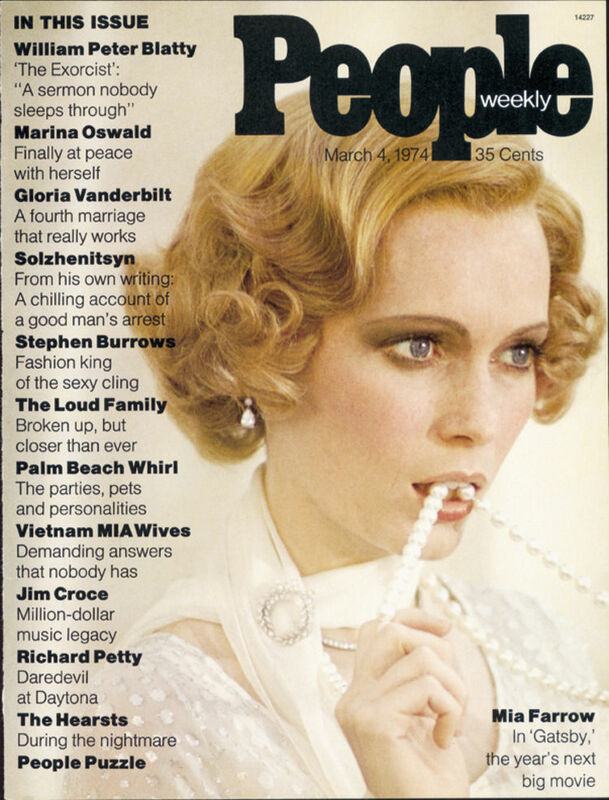 Once Robert Redford and Mia Farrow were cast in the plum parts, there was no question of who would provide the jewelry. The role went to Cartier. In the late 1960s, Cartier in New York was not only smashing records at auction with the historic purchase of the 69.42-carat diamond that would be sold to Richard Burton for Elizabeth Taylor and launching the iconic Love bracelet, it was also delving into its glorious art deco history. A cultural revival of the 1920s style, had started heating up in 1968 when historian Bevis Hillier published the first major modern work about art deco. Around the same time, Cartier began acquiring and locating its important deco pieces in American collections. Several of these Cartier art deco jewels can be seen on the leading ladies in the movie. 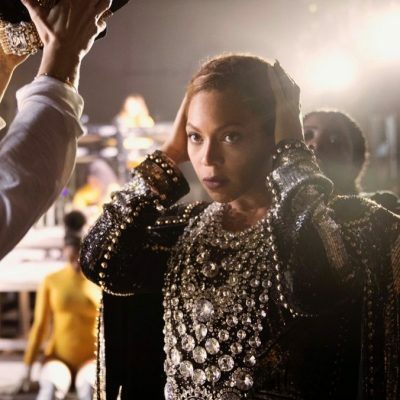 (Other jewels were made by Cartier in the art deco mode for the film.) 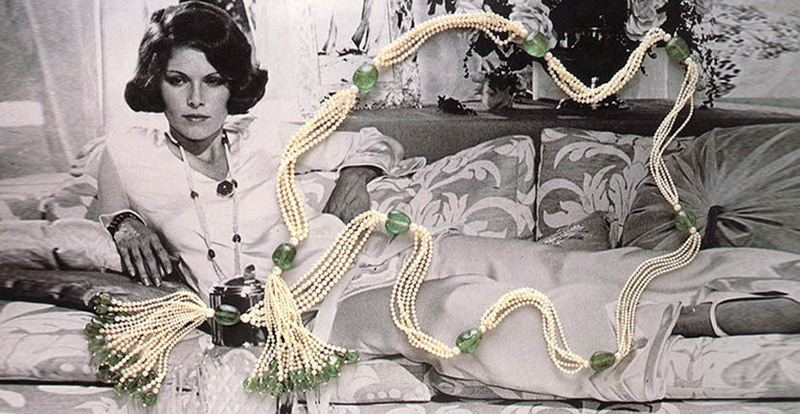 In one of the early scenes, the privileged life of Daisy and Jordan Baker (Lois Chiles) is clear from the layers of jewels they wear while lounging around the house on a late summer afternoon. Jordan’s jewels include an impressive sautoir of pearls and emerald beads as well as a large carved emerald and diamond brooch seen in the photo above. 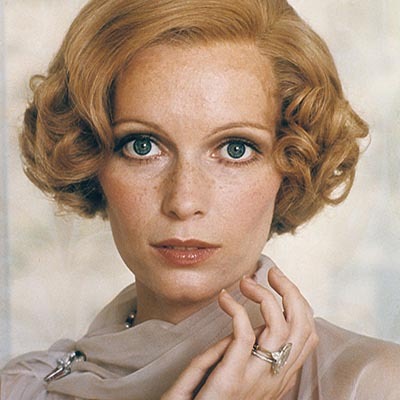 Daisy has on a slender diamond choker, a diamond line bracelet, diamond pendant earrings, a delicate diamond circle brooch, a strand of pearls and a massive marquise shape diamond engagement ring and diamond wedding band. 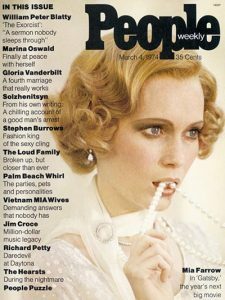 This first look was immortalized in popular culture when Mia Farrow appeared wearing it on the cover of the debut issue of People magazine published on March 4, 1974. 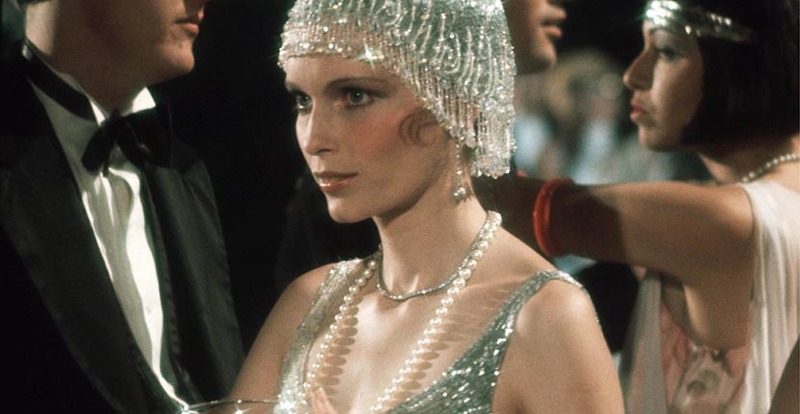 When Jay Gatsby meets Daisy on the lawn where she is drinking champagne and wearing a beige chiffon ensemble, she is bejeweled in a different pearl necklace. The strand is interspersed with small black onyx and coral discs that echo the gems in her Love Bird brooch. 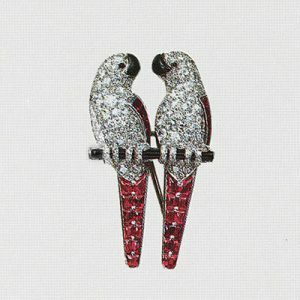 Designed as two ruby, onyx and diamond parrots the jewel was made by Cartier, New York in 1928. It is clearly a metaphor for Jay and Daisy’s romance. Daisy also has a small Cartier art deco gold and gem-set vanity case in the scene. One of the most impressive art deco designs in the movie is worn by Jordan when everyone heads to New York City for an evening out. 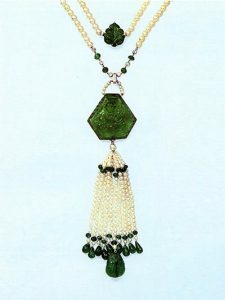 It is a pearl tassel necklace with carved emerald accents and an 86.71-carat carved emerald at the center made by Cartier in New York around 1925. A gem set watch Daisy wears at a party on Long Island threads back to F. Scott Fitzgerald. 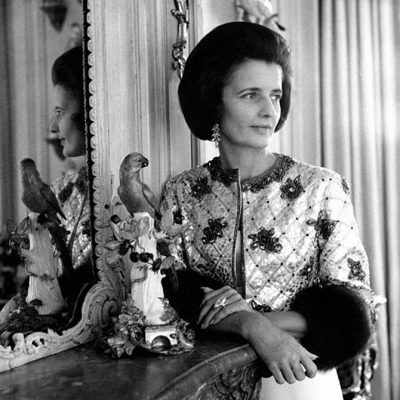 The author gave his wife Zelda a diamond studded wristwatch from Cartier when he received the earnings from the sale of his book This Side of Paradise. In many ways The Great Gatsby was the first public display of Cartier art deco since the 1920s editorials in magazines. Two years after the film was released the premier Cartier art deco exhibition, Louis Cartier Retrospective, was staged at the Fifth Avenue Mansion in New York. Several of the pieces from the film appeared in the critically acclaimed presentation that included 150 jewels, clocks and objects. A portion of the proceeds from the publication for the show benefited the American Cancer Society. Princess Grace in her capacity as the Honorary Chairman of the International Committee for the benefit preview of the retrospective wrote an introduction for the publication that said: “I am sure this exhibition will prove to be a great success in bringing enjoyment to those who love great design and who appreciate great genius both of which Louis Cartier epitomized through his long and prolific career.” A photo of Princess Yasmin Aly Kahn, Rita Hayworth’s daughter, looking at objects in the exhibit was published in The New York Times. Other notables who attended the opening included Nan Kempner, Lyn Revson, Pat Buckley, Amanda Burden, Mary Lou Whitney, Doris Duke, Mica Ertegan and Helene Rochas. The popularity of the presentation and the numerous others that have followed over the years have long since secured Cartier’s position as the preeminent jeweler of the art deco era. 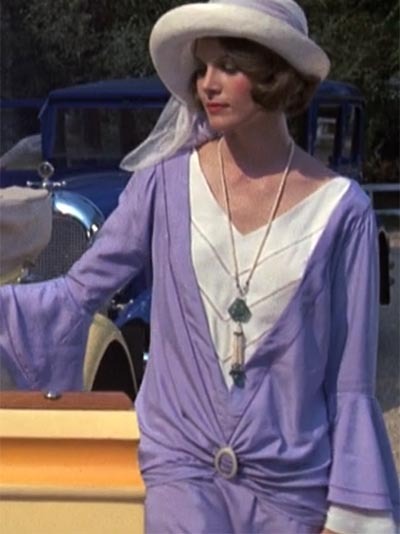 Yet no exhibition has ever quite captured how the jewelry was worn during the roaring twenties like the 1974 production of The Great Gatsby.